I have a beautiful 1997 MCC Custom Harley Lowrider for sale that 105 Horsepower and incredible Orange paint job that you must see to appreciate. Totally tricked out with S&S Super Carb, Tripoli FX frame, Continental Tour tires, Works Performance Suspension, 113 cubic inch V-Twin EVo 2 motor and much more. 11,600 miles and I hate to sell it but I need a car. So, if you have a 2005-6 Stratus or Chevy Malibu in good condition and some cash to trade, bring it to the table because I may be interested. The 1997 Custom Harley Lowrider cost over $24,000.00 when I bought it new and I am advertising it for sale for $10k. 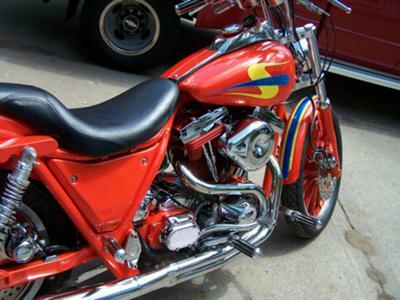 The motorcycle runs perfectly, looks great and is conveniently located in Maplewood Minnesota. If you are interested in buying it or have one of the cars that I mentioned that you would like to trade please leave your questions and contact information in the space below provided by Strike Lightning and I will get back with you as soon as possible. Strike Lightning would also encourage bikers to submit a review of the 1997 MCC Custom Harley Lowrider for sale to help potential buyers make informed decisions and to benefit the biker community as a whole.